In Australia the aboriginal people call the time of creation "The Dream Time." Now that I am solidly past a half century of life I look back on my life and view much of my early years as a kind of dream time. 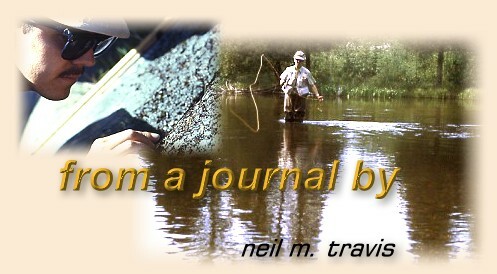 When I started to fish for trout with flies, fly fishing was on the wane. Spin fishing was all the rage. With a spinning rod one could throw a tiny spoon clear across the river with less effort and skill than it took to throw a fly 10 yards with a fly rod. Fiberglass and nylon had revolutionized the fishing industry, and spin fishing seemed destined to bury fly fishing. A bamboo fly rod with two tips, in a cloth bag and metal case could be had for under a hundred dollars. A quality reel was under twenty-five dollars, and hand-tied flies were twenty-five cents apiece. Fly boxes were made of metal, with the individual fly bins covered with tiny doors with glassine covers. Mucilin came in metal tins that cost a quarter. Flies were tied out of hair, fur and feathers. Wet flies sank, dry flies floated and there wasn't anything in between. You could carry an entire fly tying kit in a shoe box, and have everything you needed to tie any kind of fly you might need to catch a trout. The greatest advantage were the uncrowded trout waters. After the flurry of opening day most trout streams, even the 'famous ones' were virtually deserted. An especially noteworthy hatch like the 'Michigan Caddis' hatch, or the 'Salmon Fly' might bring out a few more anglers, but what we would have called crowded in those days would hardly equal a normal day's crowd on most trout waters today. If the trout streams were too crowded you could always fish a lake or pond. Only a very few fly fishers practiced their skills on stillwaters. This change in angling pressure and technique was vividly demonstrated to me last summer during a week in late July. With the local spring creeks flooded with water from the Yellowstone River, I decided to do some lake fishing. It had been several years since I taken an 'angler's holiday' and just spent several days doing nothing but fishing, so I hooked up my trailer, threw in my float tube and took off. My destination was a lake that for the sake of privacy will remain nameless; enough people have discovered it already. During the past when I had fished this lake I had only encountered a handful of other anglers. Most of them were people that I knew. The lake is large, and there was never any crowding. Fish were plentiful, and most were good sized. In mid-summer the hatches were heavy, and the trout rose with abandon. It was a delightful experience to wile away a summer morning sitting in a float tube casting to rising trout that were so numerous that their rising made the surface of the lake look like it was raining. While I anticipated things would not be as they were, I was hardly prepared for my first morning on the water. While there were still a few float tubers plying the water, an armada of water craft of every description began to appear from every cove. There were canoes, pontoon boats, McKenzie River boats, John boats and even a salt water skiff with a raised front casting platform. Several of the small one man pontoon boats had electric motors, and one even had a fish finder! Sailing majestically through this conglomeration of water craft was a large cabin cruiser with rods bristling out from every angle, like a porcupine having a bad hair day. If it had not been such a sad sight it would have been comical. The effects on the fishing were even more dramatic. While it appeared the hatch of insects had not been effected by the increased crowds, the fishing had been markedly changed. The large groups of feeding fish were gone, replaced by an occasional riser that dared to stick its nose above the surface to take a fly. All of the fish were extremely spooky, and seldom would any fish rise more than two or three times in any location. The anglers were quickly scurrying from one rising fish to the next as quickly as their motors would get them there, hoping to get in a cast or two before the fish quit. They were seldom successful. By poking around quietly in a small cove I was able to cast to a few trout before they stopped rising, and they were the same good fish that I had enjoyed years before, but the angling experience was not. Later I spoke with one of the few old timers that still fishes the lake. He said my experience was typical of the current angling conditions. The crowds come early and they stay until the winter winds drive them away to warmer climes. The increased pressure has caused the trout to become very difficult to approach, and most of them are now caught by trailers, or by anglers who fish nymphs on sinking lines. Due to the competition to try to reach the few sporadic risers most of the float tubers have turned in their tubes for pontoon boats equipped with electric motors. The results have been that the fly fishing has disintegrated into a battle fueled by technology. On the rare occasions when the modern flotilla stays in port the lake is strangely quiet; the trout never resuming their old feeding patterns.